I met Danielle back in February, just one short month after opening our doors. She was in search for a wedding dress that she was confident in and would be happy with for a long time to come. She fell in love with a gorgeous Martina Liana and paired a veil to match and the rest was history. She married Tauland Kruja on October 27, 2018 at The Ringling in Sarasota, Florida. How did yours and Tauland’s love story begin? Tauland and I started dating in 2015. Our first date was at a miniature golf course. Tauland was the perfect gentleman by letting me win (at least that is what he says). We shared a small cheese pizza for dinner and finished the night with ice cream from Sweetberries. How did Tauland ask you to be his wife? To get me to go to Orlando without suspecting anything Tauland told me he had an oral surgery appointment with a teacher’s friend. Seemed logical by the fact he was a dental student. The first surprise was when we arrived at the Waldorf Astoria, not only were we staying at this amazing resort we had a view overlooking Walt Disney World and the fireworks. The following day he surprised me again by taking me to Magic Kingdom. When we got up to the castle, Tauland got down on one knee and proposed. That night, Tauland got us reservations for the Wishes Dessert Buffett. We had access to unlimited desserts with a table overlooking the castle during the fireworks. 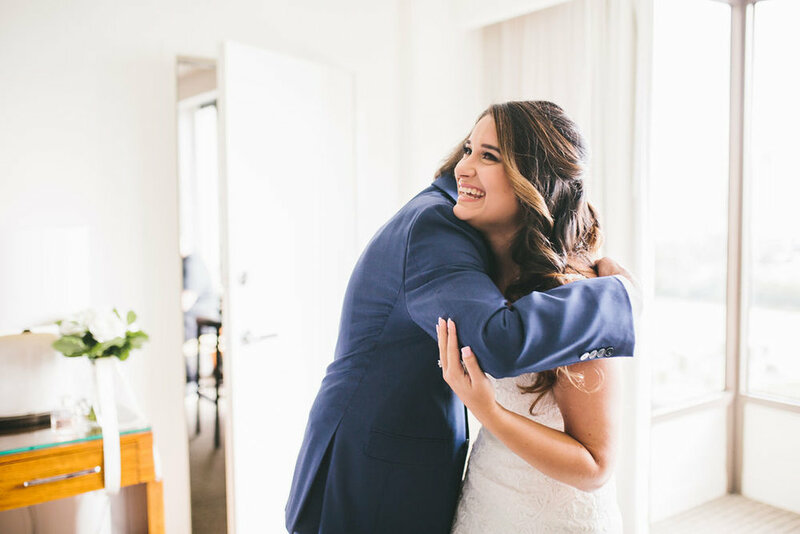 What was your favorite memory from the day of your wedding? Our first look. I feel I was able to have the opportunity to have so many extra great pictures while having our first look. And I don’t think it took away from walking down the isle. I saved wearing my veil for walking down the aisle to give Tauland a little surprise and keep some mystery. Enjoy the process and have a planner or day of coordinator. They took so much stress of my plate so I could focus on just enjoying the moments. I had recently moved to the area for Tauland's dental school. Though I had already purchased a dress somewhere else I was having doubts. I found Margaret Ellen online and just had a gut feeling I needed to go. I had two separate appointments with Maggie going with a different bridesmaid each time. She made me feel so comfortable and like family, which was so nice because I didn't have family that could be with me. After having many top contenders I knew I found the perfect dress. The new Mr. and Mrs. Tauland Kruja honeymooned in London, England and then took a small cruise out of Southampton, England to Paris, France and Brussels, Belgium.